This is the upholstered rocking chair with the tall back for an updated profile on a classic furniture piece. Measuring over three feet high, the tall back provides a comfortable resting place for the head and shoulders when reading, knitting, or napping. Seat and back cushions are a luxurious 2" thick and upholstered in a sturdy light grey acrylic blend. The durable wood frame, finished in a rich espresso, has slightly curved armrests for added support. 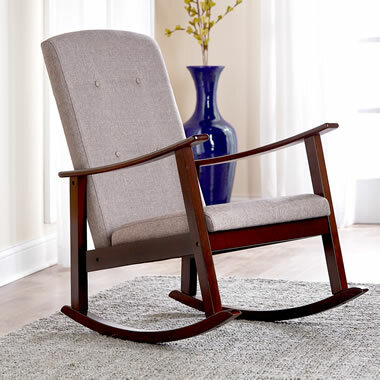 Panelists from The Hammacher Schlemmer Institute praised the rocker’s good looks and clean lines. 40" H x 34-1/2" W x 28" D.
The High Back Comfortable Rocker comes with The Hammacher Schlemmer Lifetime Guarantee. Items that we sell are guaranteed for their normal life under standard non-commercial use.